I had been re-writing my Tea-set pattern in a kind of half-arsed manner over a few months. Pattern writing is boring, but pattern RE-writing is even more boringer . Not that there is anything wrong with the original pattern, but it was written a while ago and I have learnt a few things since then, so it was time for an update. 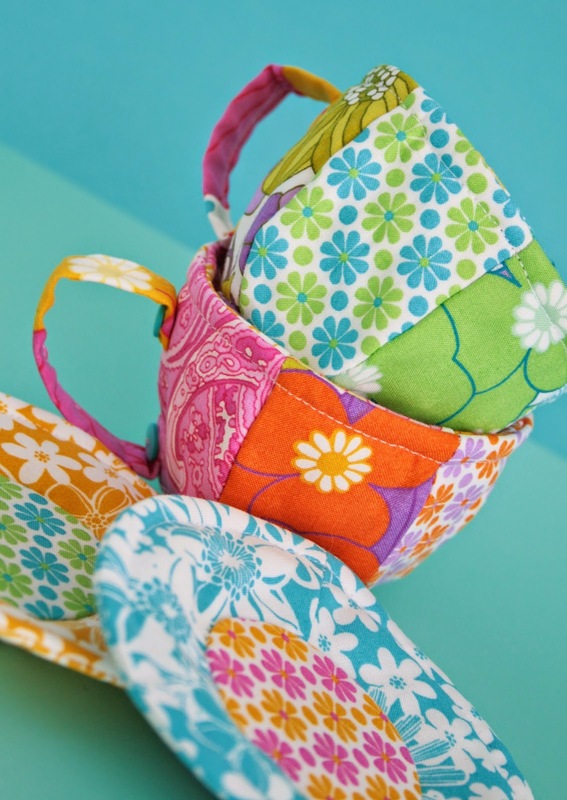 When Emma offered me a selection of her yet-to-be-released fabric range, The Linen Cupboard I knew it was the perfect tea set fabric. I bought considerably more than two cupcakes to star in these photos but in the spirit of artistic integrity I ate the photogenically challenged ones. 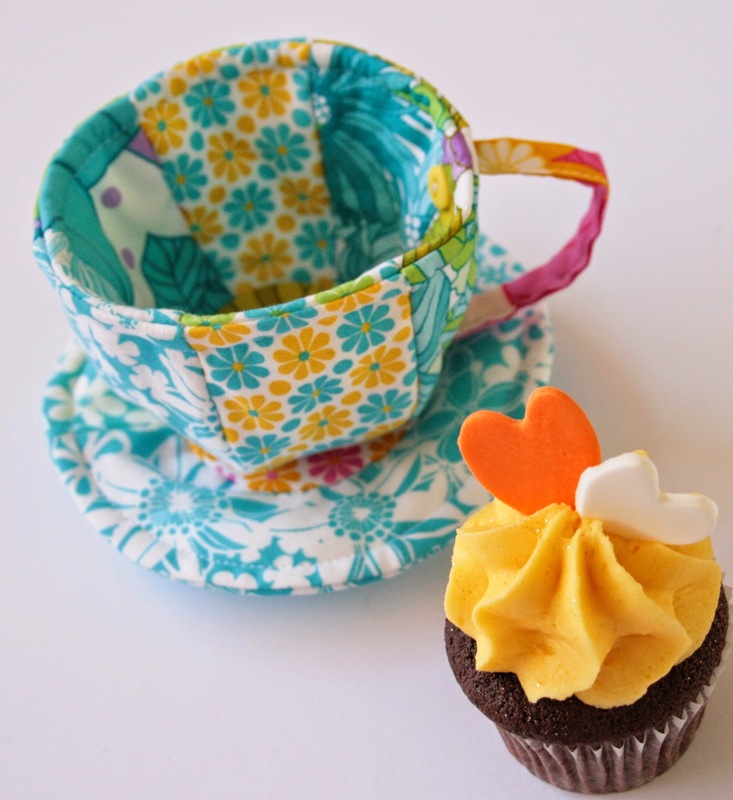 I nearly tried to buy the pattern for the cupcakes! I have made one of your teapots before - I love it - but, if I ate all that blue food colouring, I would probably be able to make a whole teaset in an hour or so. there must be enough GO in that blue icing to get you through the next round of boring. and depending on how many you ate, to arrive here in a rowboat. 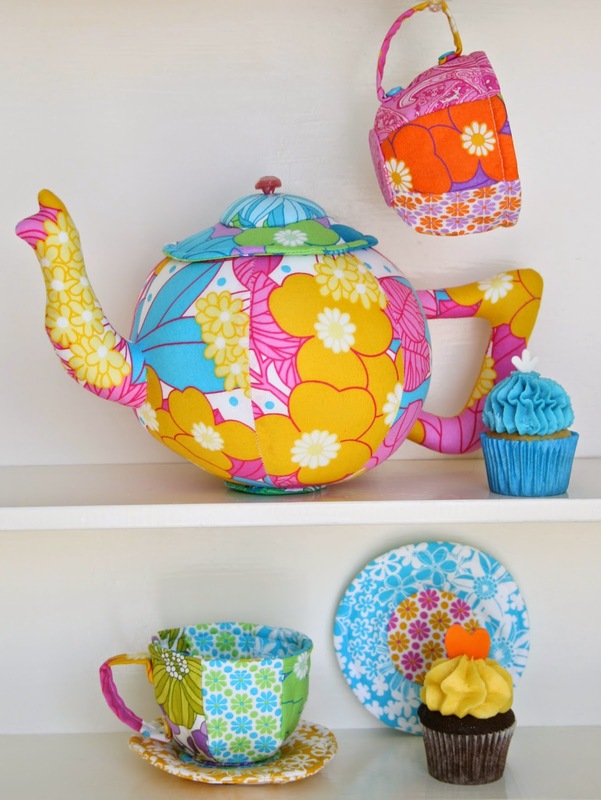 that's a very pretty teaset. Your Emma should sell kits with your pattern. I've always taken a somewhat irrational pleasure in your teapot. It looks as though it'd have a bloody good 'pour'. Now go eat more un/photogenic cake. They look great Jodie...cakes too! The blue icing worries me but I'm sure you chose it in the spirit of colour-matching (or something). Anyway - the cakes look yummy and the tea set is fabulous. Now go and get ready for school. An artist must do what an artist must do. And cupcakes must be sacrificed in the making of art. So Super Cute! Oh man, you should have eaten all the cupcakes because they are way too distracting. Now I have to go eat a cupcake, thanks to you! Maybe I'll have a cup of tea too, while I'm at it. I would have eaten them as well. I would have needed a plastic cupcake for the photo shoot!